What is a harmonised major scale? If you want to know all the chords in a particular key you will want to know how to build and use a harmonised major scale. This can be really useful when you’re song writing because it makes it so easy to know which chords will go together well. To really make good sense of this page you’ll need to know a few other things first. What you need to know before you’ll understand this page. If you don’t know about how to build a major scale, how to build chords or key signatures then use these buttons to find out. There are two main ways we use to understand the harmonised major scale: method 1 is using mostly theory, method 2 is just looking at what happens on the guitar neck when we stack notes up for normal chord shapes. Study both, they’ll both be useful and if you can’t understand it one way then the other way may work better for you. Let’s build chord I in G major. This means we’re going to use just these notes to build the chord. Chord I will be built on top of note 1 from the scale. We build a chord by taking three notes. We call the note we start from 1 or the root, then we use notes 3 and 5 from there. 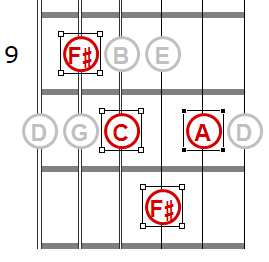 So in G major we get the notes 1- G, 3 – B and 5 – D.
Here is part of the guitar neck again, frets 3 – 5 but with these notes highlighted so that they fit one of the chord shapes above. The notes are not stacked in the order of G then B then D, buy the lowest note is the root of the chord – G. Then the notes get repeated to cover all the strings and that’s how we end up with this shape. Notice that if we played a minor chord shape it wouldn’t fit the notes of the G major scale. So chord I has to be a major chord – G major. If we take the 1st, 3rd and 5th notes of a major scale and play them together we get a major chord. We would call this chord I. Now remember, if you change any of these notes you’ll get a different type of chord. So for example if we take the 1st, 3rd and 5th from the scale of C major we get the notes C, E and G. If I flatten the E to Eb then we get C, Eb and G which is a minor chord. For example if we want to tell someone to play a C major chord we just just write ‘C’. That means the 1st, 3rd and 5th notes of the C major scale played together to make a chord. If we want an E major chord we just write E – that’s the 1st, 3rd and 5th notes from E major, which are E, G# and B. If we want to specify a minor chord, we add ‘m’. For example ‘Cm’ means play a C minor chord. That means we take the normal notes of the C major chord – C, E, G but we flatten the 3rd. So in Cm we get C, Eb and G.
If we compare the notes in a C major chord C, E, G with the notes in the minor chord we see we’ve got 1, b3, 5. So what if we’ve got the notes F, Ab and C? Well that’s Fm because the notes in F major would be F, A, C. The Ab would be a b3, which makes it a minor chord – Fm. Let’s look at what happens when we start building a chord from the second note of the major scale. Again we’ll work with the C major scale so we don’t have to think about sharps or flats. We build the chord in the usual way with a root note (this time the second note of the C major scale: D), then the 3rd and 5th up from there, using just the notes of the C major scale. So when building a chord on top of the second note of the C major scale the first note we’ll use will be D, then a 3rd up from there is F and the 5th will be A. So the notes will be D, F and A. Now, in order to tell what sort of chord we’ve got here we’ve got to compare it to the D major chord because we always name chords in comparison with the major chord. So you can see that when we build a chord up from the D using the notes from the C major scale we get a D minor chord. To make a D major chord we’d have to have an F#, but in C major we get a plain F natural – that’s a b3, and so this is a minor chord. So chord I is major and chord II is minor! Now let’s build chord III etc – ‘cos it’s good to practice! We’re now going to build a chord on top of the 3rd note from the C major scale, which is the note E, and find out what sort of chord that one is. So first let’s grab the notes – E, G and B. We took the 3rd note from the C major scale and built a chord up from there – so we got the E, then moved up a third and got the G and then up a fifth from the E to get the B.
OK so the notes we get are E, G, B. Now let’s compare those notes with the notes we need to make an E major chord. To make a major chord you take 1st, 3rd and 5th notes from the major scale. So we need to know the notes we would get in the scale of E major – ‘cos that’s the note we’re building a chord on top of. E major has a G# in it. So the E chord we build from the C major scale isn’t a major chord. It has a G natural, not a G#. In comparison with what you’d get in the E major scale we’ve got a flattened third. So that makes it a minor chord. If we look at chord IV in C major, we get the notes F, A and C. Those are the same notes that occur int he scale of F major. So chord IV is major. 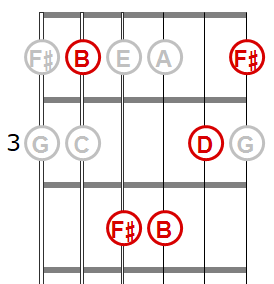 Chord V has G, B, D. The same as the notes in G major. So that’s a major chord. We get A, C and E for chord VI. A major has the note C#, not C. So chord VI is minor. Chord VII is an interesting one. The B major scale has 5 sharpened notes – F#, C#, G#, D# and A#. So the D natural we get from the C major scale is a flattened 3rd, making it a minor chord. But the F natural we get in C major is also flattened in comparison with the C# we’d get in B major – so that’s a flattened 5th. That means we’ve got a b3 and a b5. There’s a name for that – it’s called a diminished chord. So we get 3 types of chord when we build 3 note chords (triads) on top of the notes of a major scale. We get major chords, minor chords and we get a diminished chord. Here we’re going to look at what actually happens on the guitar neck. First of all we’re going to need some chord shapes. Here are the shapes we will use for this exercise. Notice that there are two versions of each of the chord types listed above – one for when you have the root of the chord (the note you build the chord up from) on the 6th string and one for the 5th string root. 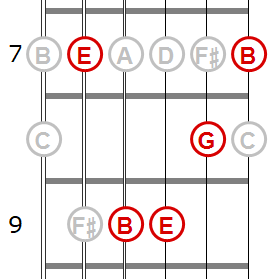 Here are all the notes you find in the key of G major shown from the 2nd fret to the 10th fret. That means we’ve built a major scale starting from G giving us the notes G, A, B, C, D, E, F# and G. They’re all over the neck here. Were going to build chords using just these notes. Any other notes would not be in the key (like F or C# or Bb etc). Let’s build chord I in G major. This means we’re going to use just these notes to build the chord. Chord I will be built on top of note 1 from the scale. We’ll use the normal formulation of 1, 3 and 5 to build the chord. So we get the notes 1 – G, 3 – B and 5 – D. Work this out counting on your fingers to make sure you understand how the chord was build. 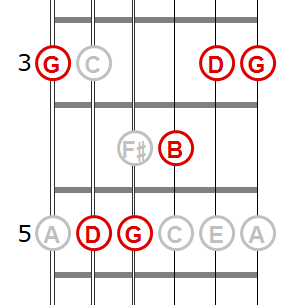 Here is part of the guitar neck again, frets 3 – 5 but with these notes highlighted. Notice how they form the major chord shape shown above. The notes are not stacked in the order of G then B then D, buy the lowest note is the root of the chord – G. Then the notes get repeated to cover all the strings and that’s how we end up with this shape. Let’s build chord II in G major. This means we’re going to use just these notes to build the chord. Chord I will be built on top of note 2 from the scale. 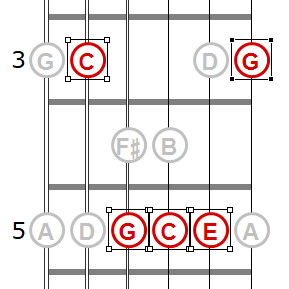 So to build the chord using the usual formulation of 1, 3 and 5 we get the notes 1 – A, 3 – C and 5 – E.
Here is part of the guitar neck again, frets 5 – 7 but with these notes highlighted so that they fit one of the chord shapes above. If we played a major or diminished chord shape here it wouldn’t fit the notes of the G major scale. So chord II has to be a minor chord – A minor. 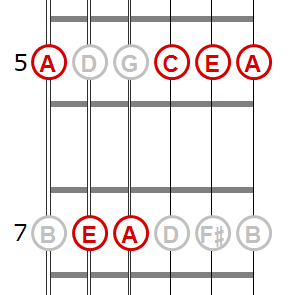 Notice that in comparison with an A major chord the note on the 3rd string is one fret lower. This is the 3rd in the chord. So we can say that in comparison with what would happen in a major chord there we have a flattened third – which is written b3. This minor chord has the notes A, C, E. The major chord shape would have A, C#, E. So in this minor chord we have a b3. Let’s build chord III in the key of G major. Chord III will be built on top of note 3 from the scale. So we get the notes B, D and F#. If you look at the diagram of the G major scale all over the neck you’ll see that you can find the third note of the scale, which is B, on both the 5th string (2nd fret) or on the 6th string (7th fret). 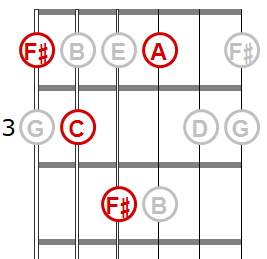 If you find the notes B, D and F# up at the 7th fret you get another minor chord shape. So it’s the same shape as chord II, but two frets higher. Let’s build chord III with its root on the 5th string now. Same notes, different locations. 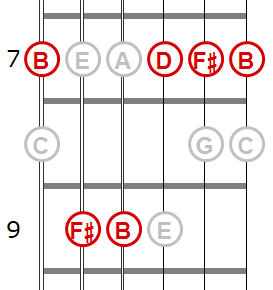 We’re looking at the neck from frets 2 – 4 now. Again, no other chord shapes will fit here. The B major chord shape would have to have a D#, so these B minor chords have a b3. So chord III is minor. In the key of G major chord III is B minor. Chord IV in the key of G major uses the notes C, E and G.
Chord IV is a major chord. In the key of G major, chord IV is C major. Chord V in the key of G major uses the notes D, F# and A.
Chord V is a major chord. In the key of G major, chord V is D major. Chord VI in the key of G major uses the notes E, G and B.
Chord VI is a minor chord. In the key of G major, chord VI is E minor. It has a b3. Chord VII in the key of G major uses the notes 1 – F#, 3 – A and 5 – C. To make a major chord here we’d need an A# for the third, so this A is a b3. We’d also have to have a C# for the 5th, so this C is a b5. When we have a 1, b3, b5 formulation it’s called a diminished chord. 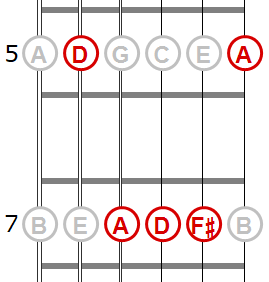 Chord VII is a diminished chord. In the key of G major, chord VII is F# diminished. All the above is fine, but what about when you want to play in D major. If you use the system above you’ll end up in a very fiddly area of the neck where it’ll be hard to get your fingers in and the pitch will be very high. What we can do is just start the whole thing from the 5th string instead. We’ll do an example in C major and then D major and then you’ll have the idea. So all you need to do is exactly the same as in C major but 2 frets higher up the neck.